Classical mechanics deals with macroscopic objects that travel with "normal" speed up to a few thousand kilometers per second. Macroscopic objects are objects that consists of about 1023 atoms (very, very approximate) or more. The mass lies in the span between microgram and upwards. Here Newton's laws, and later modifications of these, are valid. Galileo Galilee (first half of 17th century) and Newton (about 100 years later) laid the foundations for the classical mechanics. Classical electrodynamics is included in, what we today call, classical physics. Electrodynamics is based on the so called Maxwell's equations, formulated in the middle of the 19th century. Besides Maxwell we find Faraday, Ampére and Henry as important contributors to the classical theory of electrodynamics. Thermodynamics is also included in classical physics. In fact this theory can be regarded as an application of classical mechanics, where you, instead of studying single or a small number of particles (objects) observe a large number (e.g. the number of air molecules in a room) and use statistics to describe them. It is similar to psychologists who study single persons while sociologists study how individuals behave in groups (often using statistics in those studies). Thermodynamical concepts as temperature, pressure etc, deal with averages regarding properties of a great number of particles (temperature for instance is related to the average kinetic energy of atoms and molecules in an object). Famous names in this area of physics are Boyle, Clausius, Carnot and Boltzmann. Objects of atomic sizes (consisting of single or a few numbers of elementary particles or atoms) can not be described by classical physics. If you apply classical physics to such objects the calculations give erroneous or absurd results. This became more and more obvious at the end of the 19th century. Eventually, between 1920 and 1930, quantum mechanics (or quantum physics) was developed. Among the most famous names in quantum physics we find Niels Bohr, Werner Heisenberg and Erwin Schrödinger. As in the case of special relativity quantum mechanics is also confirmed beyond any reasonable doubt. All measurement and observations of low speed atomic objects are in accordance with the predictions of quantum mechanics. A large part of the observations made on macroscopical and atomic phenomena can be explained by quantum mechanics and special relativity theory. Unfortunately those theories can not deal with gravitation. This force can often be understood through classical physics (Newton's law of gravitation). Very large and very dense objects (cosmological objects like neutron stars and black holes) can however not be explained by any of those theories. Between 1911 and 1916 Albert Einstein developed the general theory of relativity. This was at first very contested, but thanks to an accumulated number of observations, made with better and better instruments, the general theory of relativity has been confirmed again and again. Today Einstein�s theory is generally accepted. In modern particle physics we study the smallest building blocks of matter, the so called elementary particles, which by no means are as elementary as once was thought. Today we know for instance that the so called hadrons (e.g. protons and neutrons) contain even more elementary particles, quarks. This has been confirmed by a great number of experiments. Some of the "tools" of particle physics are quantum mechanics and the special theory of relativity. The reason for this is that the objects studied by particle physics are small and often very fast. Particle physics is thus not only an application of quantum physics and relativity, but also a convincing confirmation of these two theoretical models. Physical phenomena in our daily lives (car engines, airplanes, falling bodies etc) is satisfactory described by classical physics. Regarding objects moving with very high speed (near the speed of light) it is necessary to modify classical physics and such objects are much better described by special theory of relativity. 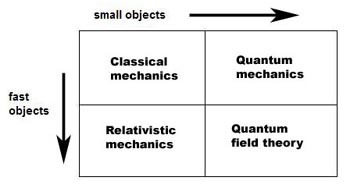 Very small objects (atomic dimensions) behave in a way which essentially differs from the predictions of both classical and relativistic physics. Here we are obliged to use quantum mechanics. For objects that are very small as well as moving fast, we must use a synthesis of quantum physics and special relativity. The foundations for this theory, quantum field theory, were laid by Paul Dirac. All these three modern theories (relativity, quantum and quantum field theory) are valid also for large and slow objects. In these cases these theories make exactly the same predictions as classical physics and are therefore unsuitable as they involve much more complex mathematics.